There’s little doubt that New Delhi will be one of the big winners of a nuclear deal between Iran and the P5+1. The framework agreement reached between Iran and the United States, along with other world powers could have far-ranging implications on Middle Eastern and South Asian geopolitics. Under the deal, Iran has agreed to limit uranium enrichment to only one facility (Natanz), while agreeing to compromises on two other facilities; it consented to redesign the plutonium heavy-water reactor in Arak in a manner that would prevent it from producing weapons-grade usable fuel, and agreed to convert the Fordo uranium enrichment site into a facility for advanced nuclear research and the production of medical isotopes. Significantly, the Iranians have also agreed to cut the number of centrifuges enriching uranium from 19,000 to about 6,000 and conceded to limiting enrichment to only 3.67 percent (i.e., not produce weapons-grade uranium). Iran’s breakout timeline – the time that it would take to acquire enough fissile material to produce a weapon – will be extended from the current two to three months to at least one year per the framework agreement. Iran has also acceded to a rigorous inspection regime under the International Atomic Energy Agency (IAEA). The restrictions envisaged by the framework are time-bound. In return, U.S., EU and related UN Security Council sanctions on Iran will be lifted, once the IAEA has verified that Iran is taking steps to fulfill its commitments under the framework. Other states in the Middle East were less sanguine that the agreement would rollback Iran’s nuclear weapons capabilities. Israeli Prime Minister Benjamin Netanyahu opined that the deal “would spark an arms race among the Sunni states, a nuclear arms race in the Middle East…is a nightmare for the world.” The Saudi statement was subtle and cautions, hoping that “reaching a final binding deal would strengthen the stability and security of the region and the world.” Other states like the United Arab Emirates, with which Iran has territorial disputes, offered no comment on the agreement. The benefits to Iran in returning to fold of mainstream of global trade and commerce are immense. Sanctions have severely affected Iran’s economy and the global slump in oil prices has forced the country to tap into its sovereign wealth fund to reimburse contractors in its active projects. The nuclear agreement, therefore, could potentially have significant positive externalities for India. 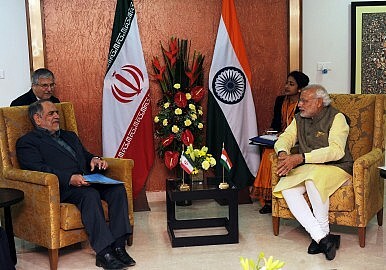 Iran’s protracted tussle with the West and the subsequent sanctions on Iran’s economy have been inconvenient to India. While Iran was traditionally India’s second-largest supplier of crude oil, economic sanctions on the Iranians since 2003 have effectively forced India to look elsewhere – primarily Iraq, Kuwait and the UAE, besides Saudi Arabia – for its imports. India has had to pay for oil that it still imports from Iran through other countries, primarily Turkey and Russia. For Iran, sanctions have meant that it has had to accept payments for a significant portion of its exports to India in Indian rupees, leading to large and unused reserves of the currency in Iran. The announcement of the framework agreement has been received positively in India. Indeed, there is already news that two Indian energy corporations, Essar Oil and Mangalore Refinery and Petrochemicals, plan to import oil from Iran this month. It would be naïve to think that the Taliban has held out against the U.S. and the Afghan government for almost fifteen years only to turn around and enter into some sort of compromise with Ghani’s government. The Taliban’s goal is Kabul, and with foreign troops slowly departing, they are likely to press their advantage sooner rather than later. Both Iran and India have an interest in ensuring that Afghanistan does not revert to the Taliban-controlled Pakistani client state that it was in the 1990s. To that end, India and Iran must engage each other to strengthen the hand of the government in Kabul. Further, if a nuclear deal is finalized, the U.S. may be far more open to engaging with the Iranians on Afghanistan, which bodes well for India. Broadly speaking, neither the U.S. nor Iran feels particularly comfortable at the prospect of the reemergence of the Taliban in Afghanistan. Finally, the deal may also provide the necessary impetus for India and Iran to ramp up cooperation on the development of the Chabahar deep-water port. Chabahar’s strategic location will make it a critical transit point for trade between not only India, Iran and Afghanistan, but also provide connectivity to Central Asia and Europe, via the International North South Transport Corridor (INSTC), which is estimated to be 40 percent shorter and 30 percent less expensive than trade via the Red Sea-Suez Canal-Mediterranean route. Chabahar will also provide the means for India to pursue trade with Afghanistan by completely bypassing Pakistan. Despite being a signatory to a trade and transit agreement with Afghanistan, Pakistan has reportedly made it difficult for the Afghans to gain access to the Indian market. Access to India via the Wagah and Attari borders continues to be restricted. With India already having built a 200 km road linking the Iranian town of Zaranj to Delaram in Afghanistan, Chabahar presents a safer and more economical means for India and Afghanistan to pursue trade than most current options that utilize transit routes through Pakistan.